Einstein's theory of gravity may have to be rewritten, after researchers at the University of St Andrews found a gigantic ring of galaxies darting away from us much faster than predicted. This 10 million light year-wide ring made up of small galaxies is expanding rapidly like a mini Big Bang. The team believes our neighboring galaxy, Andromeda (above), once flew past our own galaxy at close range, creating a sling-shot of several small galaxies. "In Einstein's gravity paradigm, hypothetical dark matter is always invoked," said Indranil Banik, at the University of St Andrews. "Such a high speed requires 60 times the mass we see in the stars of the Milky Way and Andromeda. 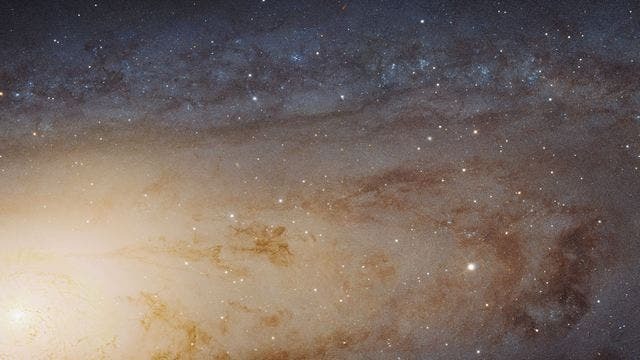 However, the friction between their huge halos of dark matter would result in them merging rather than flying 2.5 million light years apart, as they must have done." If true, the discovery would force a new understanding of gravity and about our cosmos, as such a galactic flyby only makes sense if gravity weakens more slowly as galaxies drift apart than mainstream thinking suggests. "The ring-like distribution is very peculiar," said Banik, who led the study. "These small galaxies are like a string of raindrops flung out from a spinning umbrella. I found there is barely a 1 in 640 chance for randomly distributed galaxies to line up in the observed way. I traced their origin to a dynamical event when the Universe was only half its present age." This tsunami-like wake in the sky was likely stirred up by a near-miss of the speeding Andromeda galaxy with our own galaxy, the Milky Way. The two massive galaxies always orbited each other in a plane and would have scattered dwarf galaxies in their paths, perhaps explaining why the speeding dwarfs are in a plane also containing the Milky Way and Andromeda. "Science progresses through challenges," said Marcel Pawlowski, a Hubble Fellow at the University of California, Irvine, who prompted Mr Banik's discovery. "Together with two other known planes of closer-in satellites, this gigantic ring forms a serious challenge to the standard paradigm.